Stay at safe distance, please: handmade fireworks on New Years Eve on corner of Burgos and Durban Street. Generally speaking P. Burgos Street in Makati is very safe. Police patrols are constantly on the road controling traffic. Each bar and hotel have armed security guerads who turn away people who appear shady. Crime rate is very low compared to other parts of Metro Manila and to red-light districts around the globe. There are beggars, street walkers and some scam artists, but they take a hike once they see a police patrol, usually. It's safe to ignore them and move on. However, there is one very dangerous day on Burgos Street that requires attention: New Years Eve. Local Filipinos enjoy handmade fireworks that are lit up with large torches on the street. It's probably best to stay inside the bars or avoid this quarter during the hey hours of 31st December and New Year. I have never seen a serious injury myself, but it's scary to watch the drunk firework guys light up rockets and crackers without reasonable safety meassures. Not far from the corner of Kalayaan Avenue budget patrons find a happy hour treasure inside Stardust bar. This club presents an extended Happy Hour with discounted drink for customers and ladies. Stardust bar is known for it's dance shows since it was just the second bar after Jools to present performances aside from regular bargirl agogo dance. There is lots of space in the bar to play pool and don't forget all the dark corners. Makati's Burgos street bars have a fine reputation for nightly entertainment and it's reach is going international as Wanchai district in Hong Kong shows. 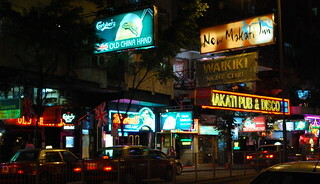 Bars like New Makati Inn, Waikiki Night Club and Makati Pub and Disco offer amusement and dating places with Filipinas for guys who appreciate meeting women from the Philippines in China. The concept of ladydrinks while providing ground for consentual meetings proves to be a commonly accepted form of hospitality business. While walking along Makati's Burgos Street it's not uncommon to be approached by attractive ladies. Most of the times they are doorgirls who want to solicit new customers for their employing establishments. Sometimes they are streetwalkers (and many of them are not female if you know what I mean) who are provinind pleasures in short time hotels on Durban Street, Makati Avenue, Buendia or somewhere in Poblacion village. However, some of the street flirters are massage therapists or promo girls handing out business cards for legitimate massage shops. To be honest, this place should be renamed to 'Vampire bar'. Their working girls are so greedy, they will try to milk out every little cent and penny out of your wallet. Shameless begging for tips, and re-negotiations make this place not so much fun. Maybe it was just a bad day in the office and others will experience better times. Their plush sitting areas are secluded and dark, while stage is lighted by spotlight for dancers. Very cozy feeling. Without GRO ladies this pace would be more entertaining. Across Kalayaan Avenue High Heels bar is neighbor to Monatana and Mixed Nuts (ladyboy bar). It's smaller than Billboard or Jools, but pretty much average for Padre Burgos Street bars of Makati City. Possibly, similar to Mascara or Rogues from authenticity. It's more private and relaxed with dark corners and brightly lit stage. Their mamasan has her own stable of attractive Filipina dancers. One of the most popular bars on Makati's night Mile: Billboard. On top of GRO entertainers and agogo dancers, there are coyotee girls dancing onstage. Highly attractive girls dance routines to popular RnB music. It's very relaxed place, but prices are higher than in other bars like High Heels or Flamingo. Girls here are very thirsty. They prefer shooters over Mango juice. This was my very first bar I ever visited on P. Burgos Street and it was an expensive but fun experience. Like most other girlie bars in Makati City there are dancers who work for a daily salary and GRO's who work for lady drink commissions inside Ivory Bar. Those GROs are a bit older and experienced in how to make guys feel good and important. In exchange they get drinks. Not a bad deal, but they get more drinks from you than you are ready to pay for if you don't watch out. Back then you bought 5 drinks for a girl and you could go up to the second level with a more private feel and no other customers. It could get pretty raunchy up there, but I heard that may no longer be the case. There are many hotels on Burgos in Makati, but most of them are rather expensive. If you prefer smaller, cozy places for a small budget, try out Moonlight Hotel close to Mascara and Rascals bars. Warm place to stay for just 1200 Pisos a night. This is about half the price of most other hotels in this area of Poblacion. Interiours look a bit rusty, but it's rather comfortable and clean. Somewhere in the middle of Burgos Street, Mascara bar is house between Rascals and Billboard bars. They relocated on the second floor during second half of 2011. It's a small stage and dim lights providing for a very intimate feeling, a bit raunchy with curtains on corner seats. What's going on in the VIP when the curtains close? Everybody is discreet about it, no worries. You wife won't find out about it. Dancer come and go on stage while rotating every 2 songs.